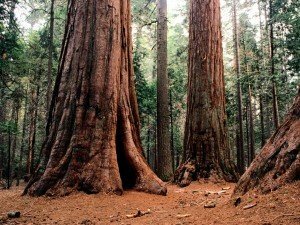 Situated a bit further east into the foothills, this grove (which includes the first Sierra redwood noted by Augustus T. Dowd in 1852) has been a major tourist attraction for over a century, and is considered the longest continuously operated tourist facility in California. Sounds like a fascinating spot for camping, yes? It seems the park service thought so, as well, because there are two camping sites at Calaveras Big Trees Park. The North Grove Campground — the closest of the two to the park entrance on Highway 4, the visitor center and the campfire center — has around 73 camping sites situated around a wet meadow offering up a flower-laden opening in the trees perfect for a little stargazing. The second site, Oak Hollow Campground, sits further into the park, offering a completely different camp experience. Situated on a tree-covered hill — pine, cedar, dogwood and fir — Oak Hollow is just two miles from the Stanislaus River and gives campers a more secluded nature experience. All campsites come with a fire ring, a picnic table, parking for two vehicles and piped water within a few yards of any camp site. Both campgrounds have comfort stations with flush toilets, coin operated hot showers and trash bins, and also offer RV camp sites. Guided hikes through the North Grove area of the park are offered on Saturdays at 1:00pm. The hike is approximately an hour and a half in duration and the cost is free with paid admission to the park. For tours, please call the Visitor Center at (209) 795-3840 or (209) 795-7980.